Pine cones are a gift of nature, not just to the birds and furry animals that use them for nourishment, but to crafters everywhere. Free, abundant, sturdy and beautiful, pine cones can be collected and used for many different types of projects. Norway spruce cones are long, thin and narrow cones that are especially fragrant, making them well-suited for certain pine cone crafts. Collect pine cones and use acrylic spray paint to make them silver, gold, red, green, blue or any color you desire. In a well-ventilated and covered area, spray cones on one side and allow them to dry before turning them over to spray on the other side. Applying one light coating at a time will prevent paint drips. For extra sparkle, finish the cones with a spray glitter, or spray with a clear acrylic sealer to make the cones shiny. Screw in an eyelet on the rounded end of the pine cone so that you can use an ornament hook to hang it up. These long, tapered cones make very elegant looking decorations, particularly on large trees. 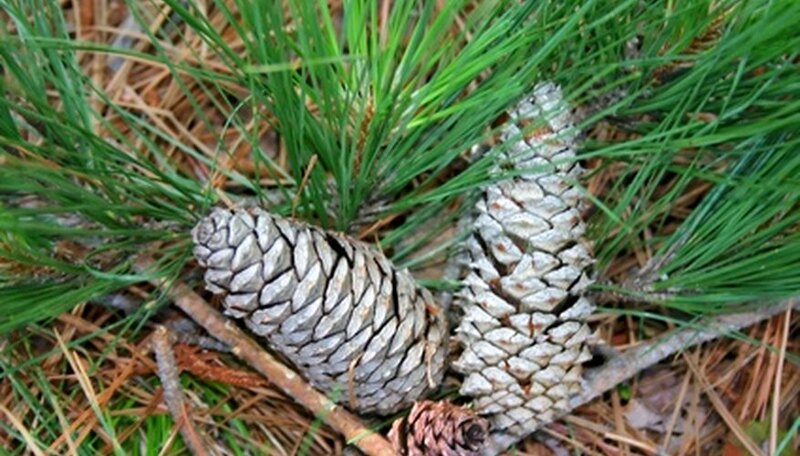 Brush a pine cone with a scented oil, such as musk or orange blossom. Roll the pine cone in a mixture of spices, such as cinnamon, ground cloves, orris root, ginger and nutmeg. Screw in an eyelet on the rounded end so that you can hang your pine cone from a ribbon. Hang it in closets, or in any room during the fall and winter holiday season to give your home a woodsy scent. Alternately, you can place them in a bowl or on a tray and set them on a side table to lend their fragrance to a room. If you would like to put them in drawers, wrap the cones in a double layer of cheesecloth and tie up the bundle to prevent herbs or oil from rubbing off on clothes. Use a foam wreath form and a hot glue gun to make a wreath. Put a strip of glue down one side of the pine cone, from tip to the back, and then press it, sideways, to the wreath form. Continue adding more pine cones, staggering them as you glue them. You can face them all in the same direction, or you can have some pointing clockwise and others pointing counter clockwise. Once the wreath form is mostly covered with pine cones, fill in the small spaces with silk flowers, leaves, twigs, evergreen branch clippings, beads, bows or small figurines. If you lay the wreath flat and put set candles in holders or flowers in a basket in the center, it makes a lovely centerpiece. Pine cones make excellent fire starters which you can use in your own home, when camping or holding outdoor bonfire parties, or give as gifts for the holidays. This craft incorporates melted paraffin wax, making it suitable for recycling your old candle stubs--just remove the wick before melting. You can scent the melted wax with dried herbs or essential oils, or you color it by adding dye or old crayon bits. Using an old pair of tongs, dip a pine cone in the wax until well coated. Place it in a tray of untreated sawdust and roll it around. Lay it out on wax paper until dry. Place the covered pinecone on kindling and light it with a match to start fires.